This week our Music Forum Journal moves online. After more than ninety issues over 20 years, our respected quarterly journal is now a creature of the digital world. We celebrate with a special feature on jazz, marking the 25th anniversary of the Wangaratta Jazz Festival, and a host of reviews of the latest and greatest jazz recordings. Music Forum Journal covers music in Australia, the work of our musicians, the music they record, and the books about them. Our writers cover all genres and activity from early childhood music education and grassroots practice, to our leading concert halls and international promotion. Over time, youâ€™ll see articles on just about any topic connected with music, exploring and debating trends and innovations, providing analysis and commentary, as well as interviews, profiles, CD and book reviews. We hope you enjoy exploring the first edition of the Music Forum Journal. Contributions are welcome and you can contact us here to find out more. Weâ€™re always pleased to hear from you and to share your activities with our readership, so please email us now. If you want to hear from us more often follow us on Facebook and Twitter where we post the latest news, opportunities and events we come across in our daily travels. The Music Council of Australia eNews is divided into 6 sections. Scroll through or, if you wish, click on one of the sections to be taken straight to those stories. The worldâ€™s largest annual music conference/festival wrapped up on Sunday in Austin Texas. As usual, dozens of Australian acts descended on South by South West (SXSW) to showcase, network and do business at one of the worldâ€™s most respected music markets. They were ably supported by our music export colleagues at Sounds Australia. The tragedy of two deaths and multiple injuries caused by a drunken driver cast a shadow over this yearsâ€™ event, but nonetheless, it continues to be a juggernaut in the business. Andrea Baker, in The Conversation, reflects on the impacts this event has on its home city in Southern Texas, and also on other great music cities around the globe including Melbourne and Berlin. A survey by the Association of British Orchestras shows that audience numbers are up despite funding cuts, but warns orchestras' finances are being squeezed by falling ticket sales, a growing preference for cheaper tickets and cuts in public investment. Orchestra leaders have warned that they are becoming increasingly dependent on donations for survival, with overall budgets down since 2010. Read the full report here. The International Songwriting Competition (ISC) has announced finalists for 2013. Recognised as the worldâ€™s most prestigious songwriting competition, ISC awards cover a broad variety of musical genres. Finalists were selected from 124 countries worldwide, with 45 talented Australian finalists in this yearâ€™s competition including Missy Higgins, The Preatures, Alpine and Bertie Blackman. Winners will be announced at the end of April, 2014. The ISC People's Voice is open until the end of March. Visit the ISC Facebook page to vote. ISC is now accepting entries for the 2014 competition. More information can be found at the Songwriting competition website. Never one to sit back, Opera Australia Artistic Director Lyndon Terracini has made another call for renewal in his art form. In an interview in The Weekend Australian Terracini makes it clear, in typically direct manner, that the artform has to adapt if it is to survive. He notes that opera houses around the world are struggling, and discusses his strategy of eclectic programming. and his argument that broader and more popular repertoire is vital. You can read more in his interview on the Australian Major Performing Art Group website. APRA AMCOS have announced this yearâ€™s APRA Music Awards will move to Brisbane for the first time, on the 23rd June at Brisbane City Hall. These awards are dedicated to recognising the achievements of songwriters and their publishers. Categories cover rock, dance, urban, pop and country music, and also feature the prestigious peer-voted APRA Song of the Year. Awards are conferred on the basis of analysis, selection by the APRA Board and voting by APRA members. The 2014 Art Music Awards are also on the move and will be in Melbourne for the first time on 26th August at the Plaza Ballroom on Collins St. Jointly presented by the Australasian Performing Right Association (APRA) and the Australian Music Centre, the Art Music Awards recognise achievement in composition, performance, education and presentation of Australian music. There are eleven national awards and various State Awards across composition, performance, and outstanding contributions by individuals and organisations in Australian music, music education, experimental music, jazz and regional music. Nominations for the 2014 Art Music Awards are now open and close on 12th May 2014. Queensland's Lyrebird Trio, winners of both piano trio prizes in the prestigious 2013 Asia Pacific Chamber Music Competition and the Ensemble-in-Residence at the Queensland Conservatorium Griffith University in 2014, will entertain with chamber music favourites in a special fundraising concert for Musica Viva Australia at St Andrew's Uniting Church, corner Creek & Ann Streets, Brisbane on the 23rd March. This is the Lyrebird Trioâ€™s premiere public performance in their hometown with all proceeds going to support Musica Viva's education programs in Queensland. To book, call 1300 786 186 or visit the Musica Viva website. The World Alliance for Arts Education (WAAE) has launched an advocacy kit for those involved in arts education in schools and communities. This useful resource provides ideas and practical strategies to promote the arts. We think this is an excellent advocacy tool and have placed it on our resources website for all to use. You can view the kit here. It also provides an historical overview of the WAAE and information on partnerships between the arts education sector, UNESCO and other key organisations. The launch of the kit coincides with UNESCO's International Arts Education Week (19th - 24th May 2014). An upcoming documentary film features a remarkable orchestra from Paraguay where young musicians play instruments made from rubbish. Directed by Graham Townsley, the documentary, Landfill Harmonic, features â€œThe Recycled Orchestraâ€, the creation of Favio ChÃ¡vez, a landfill worker and musician, and focuses on a group of children beating the odds in poverty stricken Cateura, Paraguay. The film, scheduled for release in 2014, shows how trash and recycled materials can be transformed into beautiful musical instruments, but more importantly, it shows the transformation of human beings into musicians. It is hoped that the film will raise awareness and prove that those living in poverty can in fact excel and contribute to society in a meaningful way. 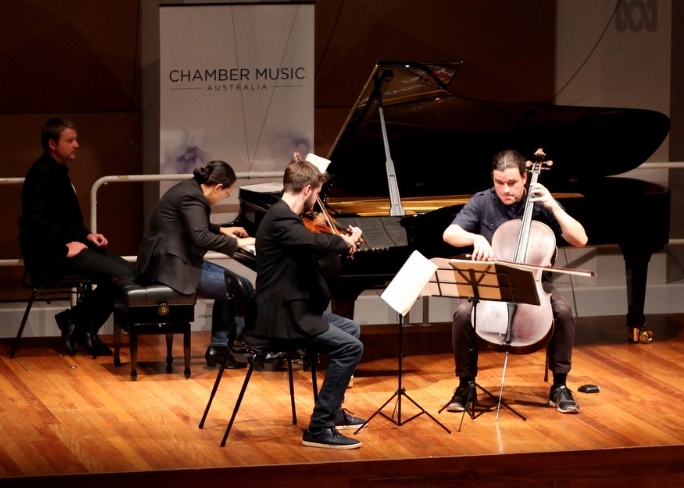 The Chamber Music Network (ACMP) Worldwide Play-In Weekend occurs annually on the first weekend in March as a global celebration of the joy of chamber music. This grassroots campaign encourages musicians of all ages and abilities to come together and play music for pleasure in a supportive environment. The event was founded in 1986, with the idea that all the participating groups would play Bachâ€™s Brandenburg Concerto No. 3. The 2014 Play-In had 100 known groups taking part around the world including in New York, Brussels and Shanghai. The ACMP website has a number of useful resources on how to stage your own play in and tips on how to get involved in 2015. To read more about the 2014 event click here. Now in its second year, the Our Neighbourhood Community Grants program offers one-off cash payments of up to $10,000. Australia Post says more than 200 grants were distributed in 2013 to not-for-profit and community organisations. If you have a great community project visit the website to find out if youâ€™re eligible to apply. Applications close 4th April. The Australia Council Geek in Residence program supports arts and cultural organisations to develop their digital skills in various areas throughout their organisation. Funding is for up to $25,000 towards paying for a geek's fee. The fee must be matched by the host organisation (all other project related costs should be covered by the host). Applications close 8th April. Visit the Australia Council Website to find out more information and how to apply. The City of Stonningtonâ€™s Arts and Cultural Sponsorship Program supports organisations wishing to present quality, innovative Stonnington-based activities which enhance the cultural, community and economic development of the City. The Program supports local community art based initiatives to be conducted in the 2014 - 2015 financial year. Applications close 22nd April. Visit the council website for more information. A NSW Government initiative celebrates and rewards outstanding achievements that help raise the global profile of NSW Creative Industries. The prestigious NSW Creative Laureate will recognise an individual, team or organisation that has demonstrated significant leadership and contribution to NSW Creative Industries. The NSW Emerging Creative Talent Award is for an emerging individual, team or organisation demonstrating leadership in originality and innovation, and contributed to raising the global profile of NSW Creative Industries. This Award will support future development with a cash prize of $15,000. Nominations are now open: and close on 30th March. The Art Music Awards are presented each year by the Australasian Performing Right Association (APRA) and the Australian Music Centre to recognise achievement in the composition, performance, education and presentation of Australian music. Comprised of 11 national awards and various State Awards, nominations must be received by 12th May 2014. The rules and nomination form are available on the APRA website. Entries are now open for the International Foundation for Arts & Culture (IFAC) Australian Singing Competition. Entries close 9th May. To find out more visit the competition website. Acclaimed for its standard of excellence, the Award is held every two years in Shepparton, VIC and represents a true test of artistic talent and technical mastery in the world of classical piano. Closing date for entries is 4th April. To view the information booklet visit the awards website. The ACT Branch of the Royal School of Church Music (RSCM) is holding its annual competition to encourage the creation of new church music that is melodic and accessible, suitable to be sung by an average parish choir. There will be a prize of $200 to the winner selected by an adjudicator, and a further prize of $200 to the most popular choice of the audience on the competition day. Applications close 19th May. To find out full application detail visit the RSCM website. Aurora Orchestra in London is seeking to recruit a Principal Bassoon to join the group of 16 freelance musicians who make up the orchestra's core team of Principal Players. Applications close 31st March with auditions held in May. To find out more visit the Aurora Orchestra website. Music Technology in Education Conference (mtec2014) is the fourth biennial technology conference specifically designed for music educators. This unique Australian conference provides an opportunity for music educators to come together, to share ideas and learn about the latest developments in technology. The conference will run from 3rd â€“ 4th October at Caulfield Grammar School, Wheelers Hill, Victoria, Australia. To find out more and register to attend click here. AIR, Sounds Australia and PPCA are now seeking expressions of interest from Australian independent labels to take part in a delegation to the American Association of Independent Musicâ€™s Indie Week 2014 in New York City this June. Indie Week has a strong focus on the exploitation of master recordings, licensing, networking and digital revenue streams. To complete the application survey click here. Sounds Australia and the PPCAâ€™s sponsorship of Indie Week 2014 will cover conference registration for small group of delegates. Australian attendees are responsible for booking and funding all flights, transfers and accommodation themselves. Held each year as part of All That Matters, the event brings together music industry leaders for a programme of talks, workshops and performances, with an emphasis on digital technology and social media. It is one of the largest events of its kind in the Asia Pacific region, attracting over 1,500 delegates from all over the world. Melbourne Chamber Orchestra (MCO) is looking to hire an Artistic Operations Manager for a 12 month contract. Applications close 31st March with the role starting in May. To find our more click here. Opera Australia is establishing a new mentorship for budding opera critics. The program offers master classes with professional critics, combined with â€˜insightsâ€™ sessions with Opera Australia artistic and communications staff, and opportunities to watch and review opera performances in Sydney and Melbourne. It is an unpaid position, designed to help a developing writer hone skills in critical writing about opera. The mentorship runs March â€“ November 2014 and will cover a variety of operas, including Handa Opera on Sydney Harbour: Madama Butterfly. Applications close 25th March. To find out more and to apply visit The Opera Blog. Opera Australia is hiring a Development Coordinator to look after their relationships with corporate sponsors. Applications close 28th March. To download an application pack, visit Opera Australiaâ€™s website. Worcestershire County Council in the United Kingdom is looking to appoint a Strategic Music Education Manager. Applications close 28th March. For more information click here. The Associated Board of the Royal Schools of Music (ABRSM) is a global leader in music education. It is a registered charity established by the four major Royal Schools of Music with the aim of advancing the arts, science and skills of music, speech and drama throughout the UK and overseas. The current CEO is retiring at the end of 2014 and the Board of Trustees are seeking to employ a replacement. To find out more information about the role click here. Vermont Symphony Orchestra (VSO) is recruiting a Development Director. The role is responsible for VSOâ€™s comprehensive development programs, annually procuring all public and private support for the VSO, cultivating long-term bonds between current, prospective and lapsed funding sources, and perpetuating the positive image of the organisation. Visit the Vermont Symphony Orchestra website to apply. Vermont Symphony Orchestra (VSO) seeking to hire a Chorus Director. This is a part-time independently contracted position beginning 1st September 2014. Visit the Vermont Symphony Orchestra website to find out more. Suzhou University of Science and Technology, Academy of Music, one of the leading music institutions in Jiangsu Province, China, is seeking to recruit an assistant to the Dean. To find out more about the position click here.